You can argue about the exact start of the craft brewing movement. Some will say it was the day in 1965 when Fritz Maytag acquired the Anchor Brewery in San Francisco. Many claim it was 1977, when Jack McAuliffe established America’s first modern microbrewery, New Albion Brewery in California’s Sonoma County. Others believe it has to be in 1978, when President Jimmy Carter signed the bill that exempted small amounts of homebrewed beer from excise taxes, bringing thousands into the hobby and creating a training ground for hundreds of future professional brewers. Then there are people who argue these were just precursors to the real start of the craft brewing movement in the 1980s, when brewers like Sierra Nevada, Boston Beer and Redhook Ale started selling beer. No matter which start date you subscribe to, the reality is that the founders of the craft brewing movement are now, 30 years later, approaching retirement. In fact, Fritz Maytag sold Anchor Brewing Co. earlier this year and other brewers who helped form the first wave of the craft brewing movement are hard at work on business succession plans. Where there were once just a few dozen pioneers making craft beer, there are now hundreds. Personalities like Sam Calagione, Adam Avery, Carol Stoudt, Tomme Arthur, Geoff Larson and Garrett Oliver are some of the modern faces of craft beer that most of us know and respect. But what of the next wave? Who might become the media darlings of the next generation of craft brewing? Who is attracting the kind of critical attention that could make them the names on everyone’s tongues when they talk beer in the coming decade? Those are not easy questions to answer. After all, think back just 10 years ago. Did you really imagine that beers from breweries like Allagash, Firestone Walker, Founders, Three Floyds, Bear Republic, Jolly Pumpkin, Foothills or Stone would come to define craft beer greatness? The constant is the craft movement pushing forward and beer fans on an endless search for the next great beer find. Here are a few brewers that are positioned to be the next craft brewing rock stars. Paul Cain says he “kind of got lucky” landing a job at Southern Tier Brewing in Western New York. He was at a friend’s house in 2004 having a couple of beers when the brewery called asking the friend to come in for an interview. He couldn’t do it, so the brewery asked if there was anyone there who could, so my friend passed me the phone,” says the 29-year-old Cain. He was designing snowboard ramps at the time and first heard about Southern Tier as planning was underway to open the brewery a couple of years earlier. “I just kind of got lucky. I said yes and got started working in packaging and shipping that summer.” The brewery had five employees at the time. I ended up training in the cellar and then gaining experience in the brewhouse.” He is currently the lead cellarman at Southern Tier..
Cain says the one constant since he has joined Southern Tier Brewing has been expansion. “We cannot make enough beer,” he says. The brewery now ships beer to more than 50 percent of the country, having just opened Florida and Georgia. When Cain joined Southern Tier, the company had 100 barrels of fermenting capacity. It now has 2,000 barrels of fermenting tanks. The expansion is coming at an extremely rapid rate. Southern Tier Brewing made 16,000 barrels of beer in 2009 and expects to reach 30,000 barrels this year. The demand for the beer stretches beyond the domestic market. Southern Tier ships beer to Europe, Scandinavia, Singapore, Australia and New Zealand. Southern Tier will make about 30 different beers during the course of a year. These include a group of year-round products and some one-off experiments. Cain says the success comes from the fact that Southern Tier Brewing is focused on reinventing Belgian-style ales and treats beer like wine. Our growth will plateau at some point, but we’re not quite at that point yet,” Cain says. If you were going to start a brewery focused entirely on making dark beer, the Southeastern United States might not be the first place you would think of locating. But that is what Paul Philippon did. In the mid-1990s, Philippon was teaching at Eastern Michigan University and decided he needed a career change. After considering a few options he decided to follow his love of making beer and enrolled at the Siebel Institute in 1996. Along with the technical classes in brewing beer, he enjoyed talking with other would-be brewers during tasting sessions that were designed around finding flaws in particular brews. After graduating, he quickly landed a job at a now defunct Cincinnati, OH, brewpub, Brewmasters. Next he moved to Pipkin Brewery in Louisville, KY, which made its own line of beers and contract brewed for Bluegrass Brewing. That company would later acquire Pipkin. Philippon’s next stop was the Williamsville Brewery near Wilmington, NC. He was at a point where he felt ready to open his own brewery. The Duck-Rabbit Craft Brewery was born out of this thinking and sold its first beer in August 2004. Operating out of Farmville, NC, the company has four year-round dark ales: amber, brown, porter and milk stout. Consumers quickly warmed to the idea of a brewery focused on dark beers, making milk stout an instant hit that accounts for 50 percent of the company’s sales. I’m somewhat surprised by it, but Duck-Rabbit Milk Stout was the horse that ran the fastest right out of the gate,” Philippon says. In the craft beer industry, timing is often everything. When Duck-Rabbit opened its doors, under North Carolina law it could not produce beer above 6 percent alcohol by volume. However, a grassroots movement called Pop the Cap was able to get legislation passed in 2006 allowing beer up to 15 percent alcohol by volume to be sold legally in the state. This opened up an entirely new avenue for Duck-Rabbit in the area of high gravity brews. The company was soon making seasonals like Russian imperial stout, barley wine, a Scottish wee heavy and a Baltic porter. A line of dark lagers also flows from the brewery on a seasonal basis, including a schwarzbier, doppelbock and märzen. Duck-Rabbit currently sells about 3,500 barrels annually. The current brewhouse could reach 4,000 barrels with more focus on brewing efficiency, but that would require cutting back on some of the seasonals and reducing some of the specialties the brewery makes. The brewery regularly fields calls from distributors around the country that it has to turn down. Mike Hall was studying electrical engineering at the University of Colorado. He could not legally buy beer, but he discovered that he could legally buy all of the necessary ingredients to brew beer. A homebrewer was born. In the early 1990s, two commercially produced beers caught his attention: Pete’s Wicked Ale and HC Berger Red Banshee. He started buying books on brewing, got involved in the local homebrew club and graduated to all-grain brewing in 1995. While his beer passion was growing, Hall was working as a field tester for a data services firm. Then economic downturn after the attacks of Sept. 11, 2001, put him out of work. I was ready to put on some brewer’s boots and decided to get out of electrical engineering,” he says. Hall went to work at Bristol Brewing in Colorado Springs for three years, before moving to Flat Head Lake Brewing in Big Fork, MT, for a year. Then he landed the lead brewer position at Oskar Blues Brewing in Lyons, CO. That all led to his move two years ago to Upstream Brewing in Omaha, NE. Upstream owner Brian McGee and his partners were open to experimenting. The city was begging for some beer change. Hall did not disappoint. Upstream has two locations in Omaha. One is in the Old Market District and the other is in the western suburbs. And while Omaha might not be the first place you think of when you talk about interesting beers, Hall points out the city is culturally sophisticated and diverse. Upstream Brewing produces six house beers on a regular basis, three rotating seasonals and two “brewer’s whims,” which tends to be extreme brews. One example is a recipe Hall concocted because the two Upstream locations have restaurants with bakery operations. Oatmeal Cookie was made with several hundred pounds of toasted oats, vanilla, cinnamon and dry hopped with raisins. While Hall said it was a good tasting brew, the name was the problem because the result really did not taste like an oatmeal cookie. The experimentation—good and bad—is all part of Hall’s plan to “keep it fresh and not repeat things” at Upstream. Gansberg decided early on at Mulhausen that winemaking might not be his thing. 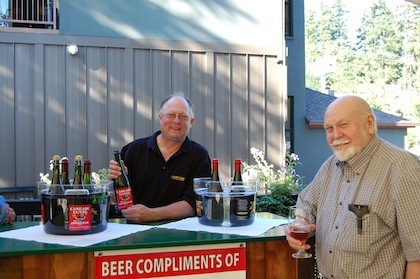 Cascade Brewing’s Ron Gansberg and beer sage Fred Eckhardt. In 1986, an opportunity developed at BridgePort Brewing and Gansberg moved over to the beer business. He would later go to work at Portland Brewing, before joining Cascade Brewing 13 years ago as the foundations were being poured. After 10 years of competing with major brewers making IPAs and other standards, and living through hop shortages and barley price increases, the people behind Cascade Brewing came to the conclusion that “we needed to create a higher value product, with higher margins,” Gansberg says. So in 2007, Cascade made blackberry, cherry and apricot sour ales. In many ways, the move to fruit beers has taken Gansberg full circle to where the climate and growing season influence the final product. And he likes to get involved at harvest time, bragging that he can pick 50 pounds of cherries in an hour for Cascade Kriek. Cascade does not use any concentrates or essences to make its sour ales. We are trying to stay very true to the fruit. The aromas, the flavors and the sourness, acidity of the fruit,” Gansberg says. The range of fruit beers ranges from the basics you have come to know from Belgian-style brewers to unique brews, such as The Vine (grapes) and Noyeaux (raspberries and apricot pits). Cascade Brewing, which is connected to the Raccoon Lodge brewpub, still makes a standard line up of beers, but it is the sour ales that occupy much of Gansberg’s time. The move to a focus on sour beers has also been reinvigorating for Cascade Brewing. The company recently established a barrelhouse on the east side of Portland that will be the home of 500 barrels of sour beer as they age. As the craft beer industry heads to the future, fueled by the creativity of brewers like Cain, Philippon, Hall and Gansberg, it will continue to reinvent itself. The next wave of brewers form a new generation of beer makers that owe the original craft brewers a debt that can only be repaid with great beer made with attention to quality and authenticity. Rick Lyke has been traveling in search of great beers for the last 30 years. He writes the Your Next Beer column for All About Beer Magazine and is a regular speaker at the World Beer Festival. Who's Afraid of a Big Bad Adjunct?